Shortly after touching down in Denver on Sunday night after my jaunt to Chicago, I jigged my way over to the Bluebird Theater to see the Bonnie Prince Billy show. Will Oldham sold out that venue (something that surprised many last-minute arrivals), and put on a sublime show that was heavier on the rollicking country vibe than his previous elegantly hushed songwriting. He played with a full backing band, including the arresting violinist/vocalist Cheyenne Mize with a huge voice — their duets together were just gorgeous. I shot pictures for the Denver Post’s Reverb site, so head on over to read John Moore’s sharp review, and take a look if you’ve always wanted to see Will in his long johns (he took his pants off on stage, saying he didn’t expect it to be so damn hot). Bonnie Prince Billy’s latest album Beware is out now on Drag City. And speaking of concert photos — I’ve added the Mountain Goats/John Vanderslice ones from last week to the original review. 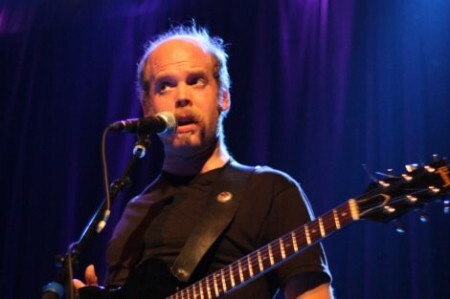 Tagged with bonnie prince billy, concerts, denver post reverb reviews. That reviewer sure seemed to whine a lot, methinks. If you’re going to stick with a musician, then do it … he/she must be allowed to change over time. I mean, I would have loved Ryan Adams to have stuck to his Heartbreaker way of doing things for a full decade, but that didn’t happen. You don’t see me balking about it. did will assume the same weird posture for every song, or just this “girl in me” song…????? I find this hard to watch. I was so sad to miss that show. that video made me even sadder. All I can say is that I have never followed Mr Oldhams career in it’s various guises, but I was fortunate enough to catch his gig on Monday evening at the Royal Festival Hall here in London, and what a gig it was too. Also another sell out, and a truly wonderful show. I am now hooked!